Flossy's gone on a trip. Three days two nights with her year six schoolmates. Since this time last year when the academic year above Flossy undertook their Year Six right of passage we've been painfully aware of it's looming presence. Flossy has been nervous married to giddy excitement manifest in the usual 'flamboyant' behaviour. Did I say nervous, I meant all consumingly, physically overwhelmingly punch your lights out if you mention it nervous. This feeling has been precipitated by the usual letters and school meetings about the upcoming trip. I can confess to having had some very tricky moments. Added to that we've had to prepare the school. Mrs C has had to give Flossy's new teacher a whole raft of appropriate background information and lay out the raft of procedures that would be beneficial to follow around sleeping, eating, etc. The usual stuff that makes us sound like overbearing and oversensitive parents. I guess we are that's therapeutic parenting for you. The inevitable game of dysregulation Twister was played this weekend when we all collectively unraveled in turns and had a proper hoo haa ding dong of a time right through to Monday morning. You know name calling and argy bargy. Then in a moment that bubble burst, we restored (I know all the phrases) and we had nothing but excitement and appropriate nerves until she left. So off she's gone. Smiling like a cheshire cat. Away from the home for only the second time in 10 years. What a hole it leaves in the house, a lot of background stuff, mainly tension, that we don't even notice anymore has gone with her. Of course we live on tenterhooks dreading an out of hours call from the school but I'm sure it won't come. More encouraging I'm look forward to her excited return, phew, it is better with her than without. I didn't say easier. On another note we got a school letter informing us that she has to go dressed as her favourite Rohld Dahl character next week. I swear they are trying to kill us...........there is no one thing that has caused more chaos in our house than bleeding dressy up days. 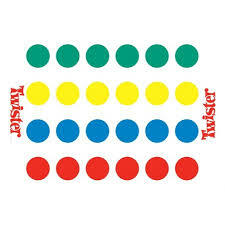 Now, where did I put Twister? Your post made Ella and I laugh - transitions are always going to be tricky for a child who has memories of trauma, uncertainty and change. Sometimes Ella and I still struggle and we are supposed to be grown up! There's no doubt about that. I think change find's chinks in all our armour. I guess some of us have more flamboyant chinks.